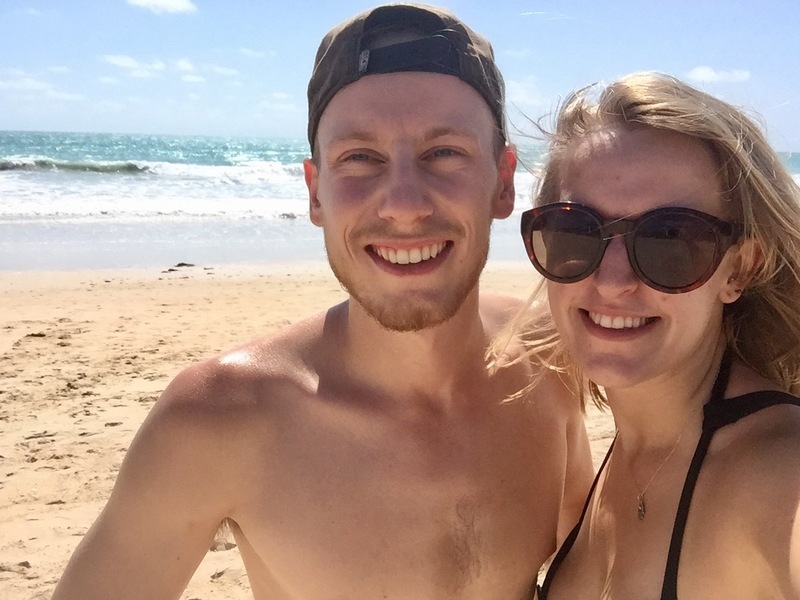 We had a couple of days of straight driving to follow our time in Litchfield National Park. 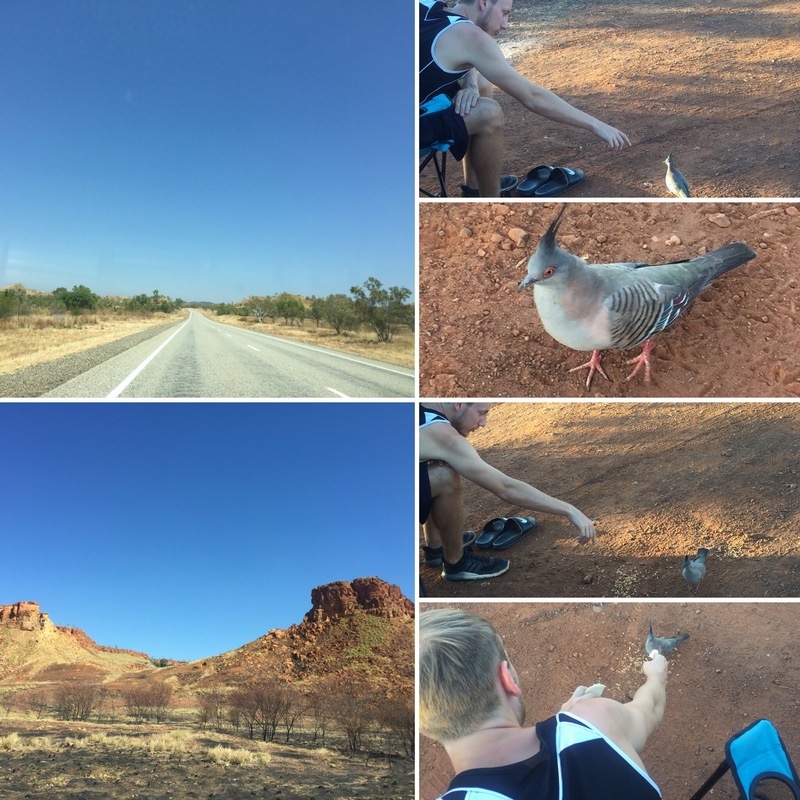 We were now heading over into Western Australia (WA) – the state that started off this big adventure of ours and the state we would be leaving Australia in! What we had to look forward to? Beautiful white sands along its coastline and some incredible national parks to keep us interested over the next couple of weeks. On the 24th September 2017, we had to go through quarantine to get rid of any fruits, vegetables and honey we had – what a nightmare if you have to make that crossing on a regular basis! Luckily we only had a couple of oranges so just ate them at the border but some people had obviously had to get rid of a lot of stuff judging by the pile of fruit and veg on the table at the side of the road. Since we had no phone service we weren’t sure what time it was as there was a time zone change when we crossed the border but we just carried on and hoped we’d get to camp by nightfall. 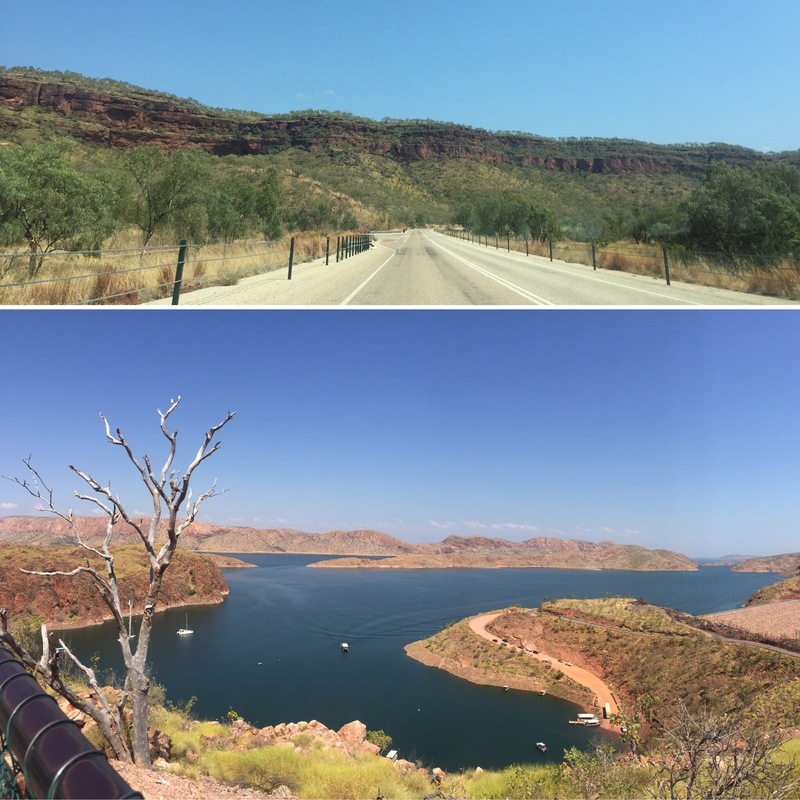 We had so much driving to do as a lot of the area between Darwin and Broome is taken up by the Kimberly region. You need a good 4 wheel drive to do this region and we couldn’t afford to rent one of those for our timescale. So unfortunately we had to cross this place off our itinerary and, instead, drive for 3 days across the Northern Territory and WA. The drive hadn’t been bad and we were experiencing camping out in the middle of nowhere so we have no regrets for choosing this journey to end our time in Australia. Our campsite for our third night of our road trip was at the Doon Doon Roadhouse which was a lovely spot with horses and a couple of dogs (that were super cute) as well as showers (something we hadn’t seen for a couple of days!). 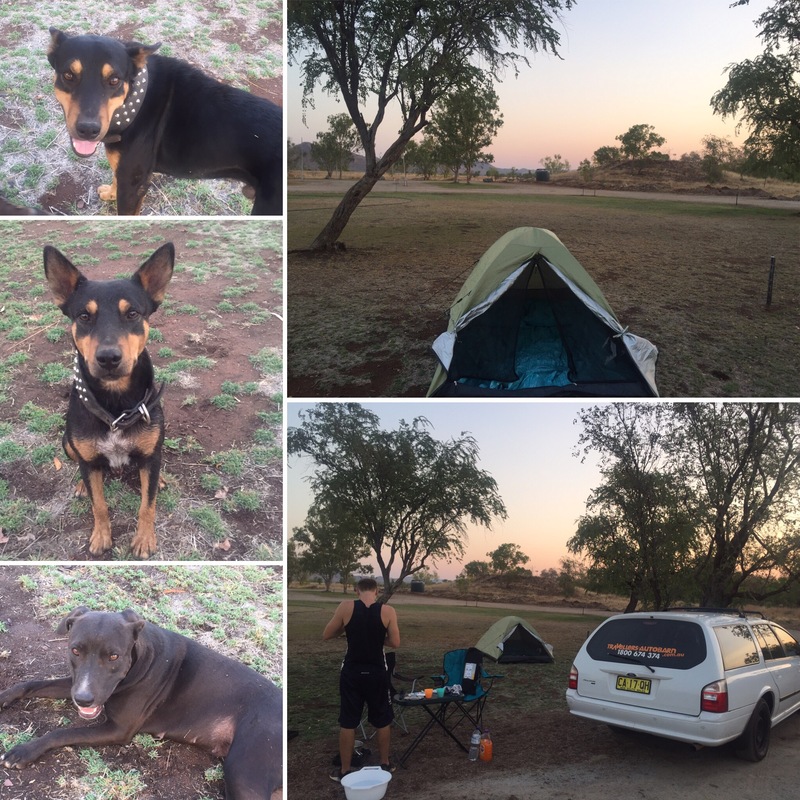 We decided to have a go at sleeping in the tent that the car company provided to see if maybe that would be a cooler nights sleep for us and, as we were now in WA so an hour and a half behind compared to Darwin, sunset was a lot earlier so we settled in for a night under the stars (hard life I know). Another day of driving was starting to take it’s toll on us. We were definitely bored of just driving and not doing or seeing anything nice. Hopefully this leg of the journey would be the only time we would have such intensive driving. I think Niall reached a new level of boredom as he ended up ‘adopting’ a very friendly bird which he named Spike that followed him around and he fed for around half an hour. It was very funny but definitely showed me that driving non-stop like this had to come to an end! 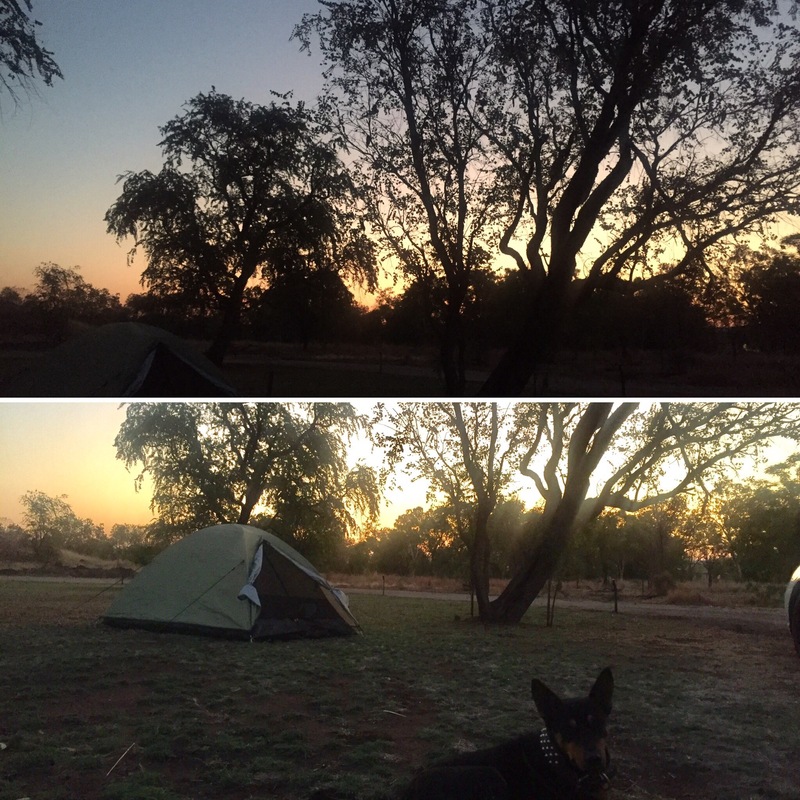 Thankfully the nights were getting a bit cooler though so it wasn’t as unbearable to be sleeping outside in the tent or in the car – and we were still getting some gorgeous, clear night skies to spend our evenings looking at. The next day (26th September 2017) after another four or so hours driving, we arrived into Broome. It was only early afternoon so we checked into our hostel. Broome doesn’t allow free camping so it was pretty much the same price to have a roof over our heads than pay to stay on a campsite. 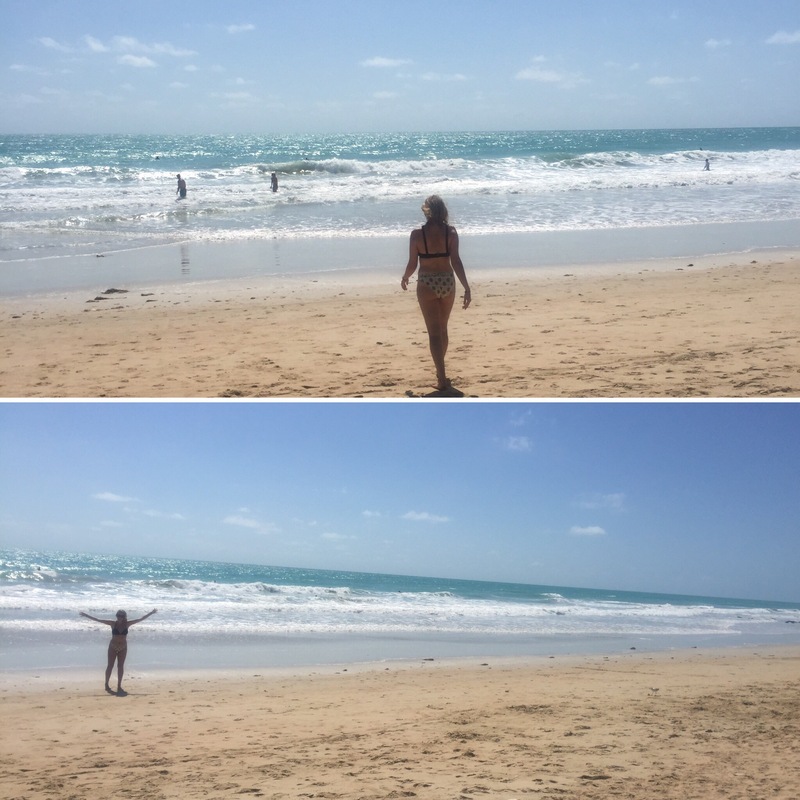 We then headed to Cable Beach, which is a famous beach in Western Australia and the main beach in Broome. 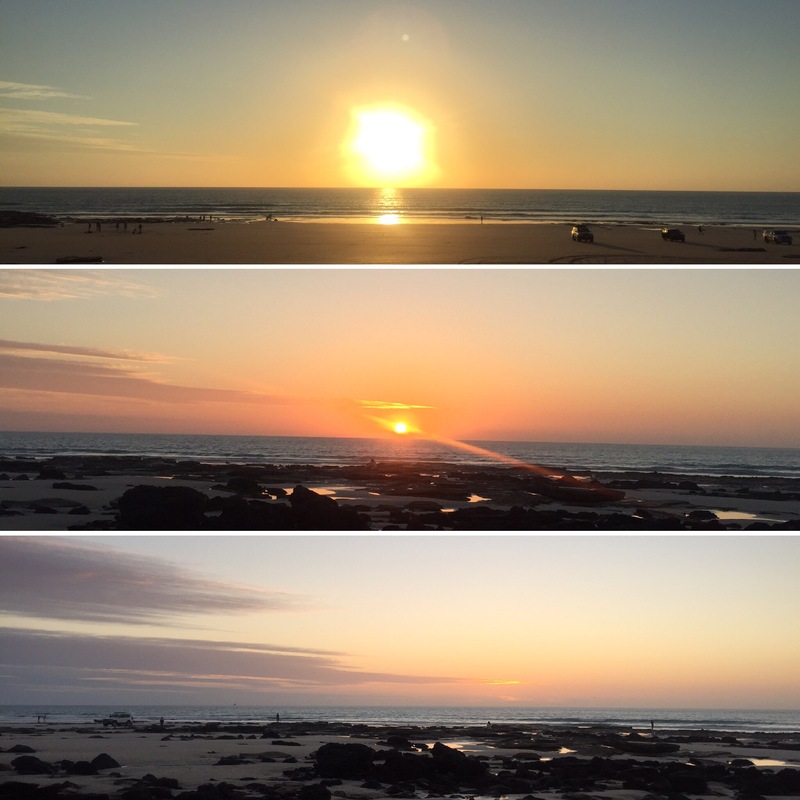 Broome is a cute little seaside town and we were only spending the night there before carrying on. It was so great to be back by the sea and especially to not be driving anymore. We used the day we had here to sunbathe and soak up the fresh ocean air. It was nice to relax and be seeing beautiful scenery again – the beach is lovely and the driving scenery had been getting pretty repetitive! We stayed for the sunset which we had hoped would be really impressive considering some of the past sunsets we had been having. 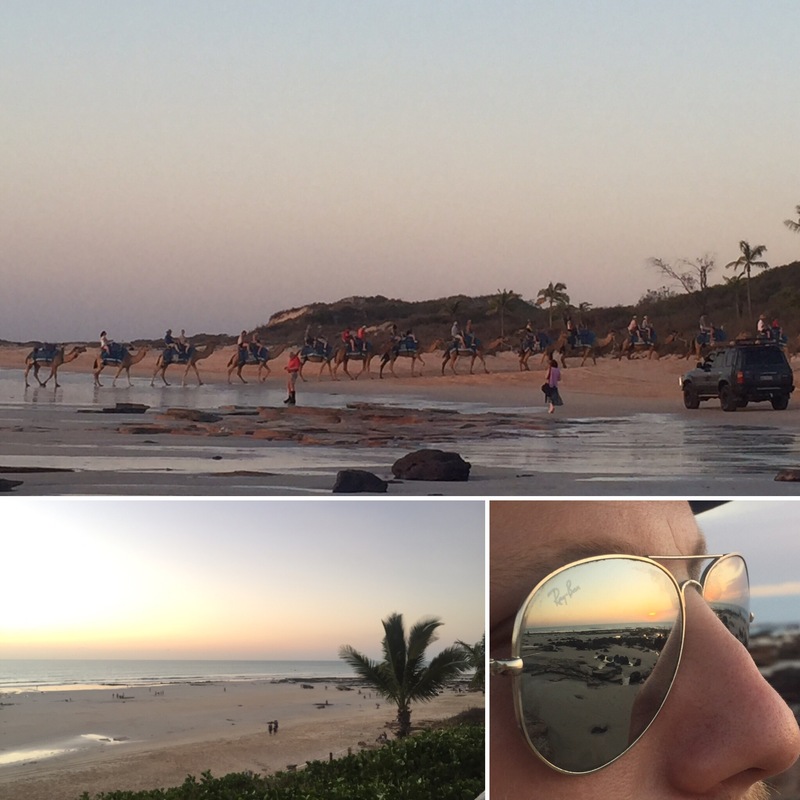 Riding camels is a big thing to do along Cable Beach but it’s not cheap. We saw prices of around $90 per person so we opted out and I think it’s all a bit too commercial for my liking. People can drive onto the beach for the sunset and the camels walk behind the cars and then stop for the sunset so really your view is more of cars than the beach. I think you’d be better off finding a nice rock to sit on like we did than bothering with the many, many camels (it’s obviously a big money maker there!). I can’t say that the sunset was anything incredible by the standards of the road trip so far. The sun was massive but then it just got dark instead of giving us all a huge burst of oranges and reds which I think we were expecting. 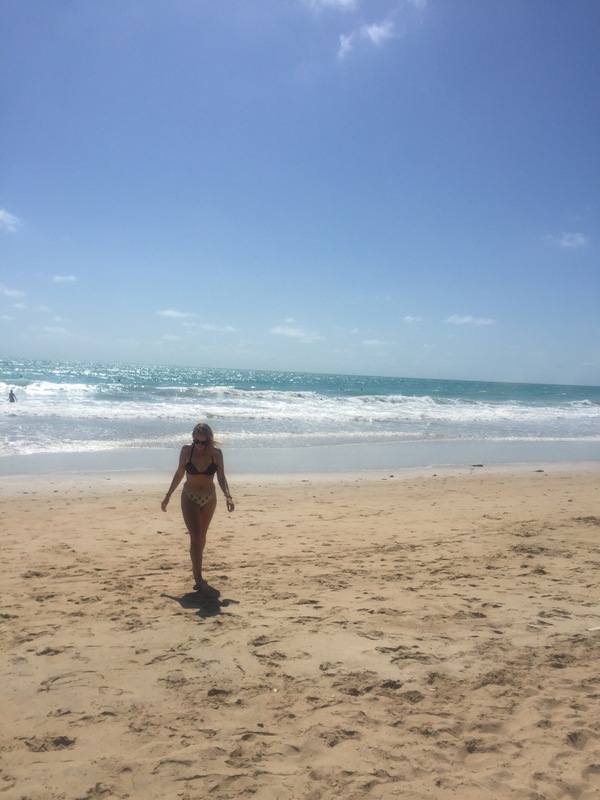 I do really like Cable Beach though and am glad we spent the day there – I can see why people go to Broome just to go there. 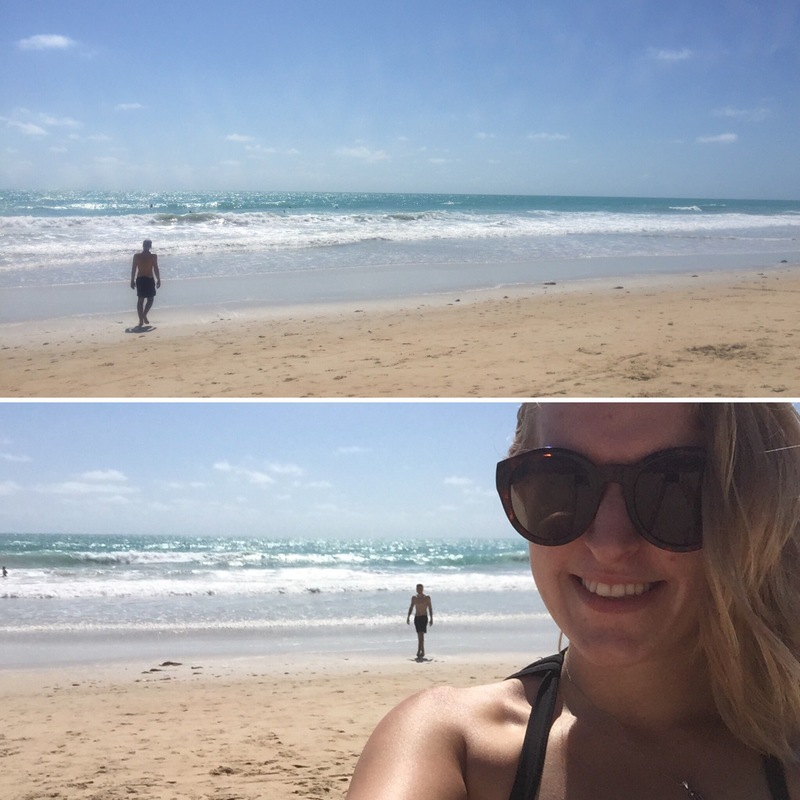 Broome is a nice little stop off on your way west (or east if you’re going the opposite way to us) and it was nice to enter civilisation again, even if just for the day!